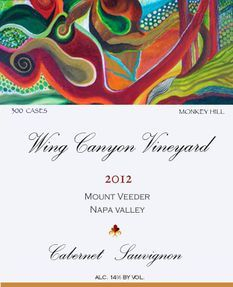 Cabernet Sauvignon is the primary wine made at Wing Canyon. They always blend the cabernet with varying amounts of estate Cabernet Franc and Merlot. The resulting wines are packed with flavors of dark red fruit (cherries, raspberries, plums and currants), hints of Mt. Veeder chaparral and spice with firm, ripe tannins. This wine opens with dark raspberries, cherries, and violets, a touch of candied citrus and spice supported by firm, supple tannins.